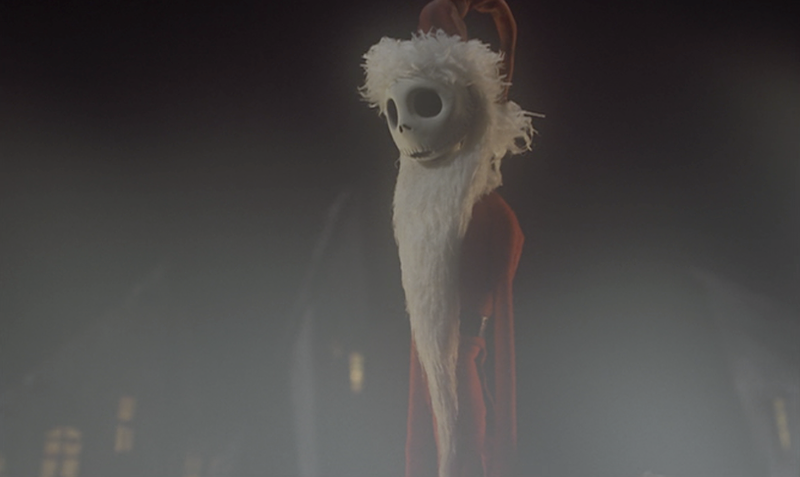 Probably very few of my readers have seen Tim Burton's The Nightmare Before Christmas, but it's one of my favorite holiday movies and soundtracks. For those unfamiliar, it is the tale of poor Jack Skellington, the king of Halloweentown, who has grown tired of the same routine year after year in trying to bring fright every Halloween. One day he discovers by himself the bright happiness of Christmas Town. He doesn't quite understand Christmas Town, but he is fascinated by it, and tries to zealously share his fascination with his subjects imprisoned by the macabre and grotesque, but fails at every turn because everything he tries to describe about Christmas they can only relate to Halloween, and this leaves him isolated and misunderstood. There are many themes in this tale I personally find to be relateable. Rereading my last post and some of the many messages in response to it sort of had me singing certain songs from the soundtrack to The Nightmare Before Christmas. Reactions to my previous post were for the most part very positive, and yes, I did read every message and comment. Yet, it seemed not everyone understood the message I was trying to convey. Instead of seeing a bright new future, many focused on the things they found to be most relateable. For example, some focused on the fact that I was disappointed or frustrated. Others focused on my own personal financial needs. While others related to my personal story that I presented and they related to it so much that they were psychoanalyzing me and sending me encouraging words. Many responded with cries of "NOooo!" as I announced the possibility of it being my last post. As I read some of these emails I began to wonder if I properly conveyed the message that was in my heart. If it wasn't for the fact that about half of the messages I received did indeed appear to get what I was trying to convey, then I would have been filled with more self-doubt. Instead, I just realized that many of my readers are empathetic individuals who related to some of the things I had to say on an emotional level. So for those who sent me those empathetic messages, know that I appreciate your concern and encouraging words. However, that was far from my primary intention. My primary intention was to make my readers hopeful and excited about a bright future, not despairingly sad. I wasn't proposing something less than what I am doing, but something more. When I spoke of my disappointment and frustration, it was over the fact that in my current situation I could not move forward in what I was doing and grow the ministry in the way I desire. This is also why I spoke about my financial situation, not because I'm looking to profit from my work here, but because I'm looking to devote my time to its expansion and growth. As for my personal story, I only mentioned the few things related to the message I wanted to convey, so if you think you know my story or understand where I am coming from, I guarantee you that you don't. My story has never been told here or anywhere on the internet. And for those who thought this was the end, though I am touched that you don't want this website to go away, know that I never intended it to end, but I was proclaiming a new beginning. Many of the messages moved me with how much the little work I do here has impacted lives around the world, in places and in ways I never could have imagined. The financial responses, though far from my goal to make the significant initial changes I was looking to make, are enough to touch my softened heart that I will continue with my daily postings on a six-month trial. This six-month trial will introduce a few updates to the website and I will put in significantly more time into all this here, but at the same time I will be looking to garner further financial support not only from the rest of my readers who have not yet contributed, but through other means as well. When I asked for financial support in my last post, many did not have the faith that things would continue. Personally, I did. I had no intention of stopping. I knew my readers would make some effort and step up to support this ministry. Like I said, I am far from achieving my initial financial goal, but I believe those who have yet to contribute will see some value in this little work I do to want to contribute something with a joyful heart, as the Lord moves them. Initially I gave till June 5th to reach my goal. This still leaves us with a little over a week to succeed in our goal. At this time I also wanted to address some questions that kept showing up in messages. Isn't the proposed $60 donation too much to ask from some people? For some people, I suppose it would be too much. The reason I proposed at least $60 is because I know how I personally frivolously spend $60, and when I give to a cause I believe in that is about the average I would give, and I am not a man of significant wealth by any means. For example, this past October I donated $100 towards the erection of a statue of Edgar Allan Poe in Boston, at a time when I did not have the money to spare. I contributed however because it is something I fervently want to be a part of, by properly honoring an individual who was born in the city I was born in and had a great influence in my life through his writings. I know there are many out there who also hold dear this little website of mine and want to be a part of its growth, and it surprised even me when a few unemployed individuals contributed $60 to the future of this ministry, even though I would have discouraged it otherwise. To make it easier on peoples pockets, I offered the $5 a month option, which by years end would total $60. Furthermore, I received many donations under $60, which I received with the same level of gratitude as I did with a $500 donation. The smallest donation I received was $2.00. The way I look at it, if one thousand people could only afford to send me $1, then that equals $1000 I would not have had anyway. So I encourage all levels of donations according to what you can afford and spare. I'm pretty sure everyone can afford at least $1. Even for those who contribute $1, I will offer their names to to be commemorated during the Divine Liturgy at monasteries throughout the world. Why don't you allow advertising on your website? Personally, I don't like advertising on my site, and I always thought most people would not like it either. I think its distracting and makes a page look too busy. My original idea was to first reach out to my readers. I wanted to see if my readers placed any value on my work and this website and my vision for a future ministry. This is not just about me making money. Ministries should primarily be supported by the people it benefits and has value for. Plus, I believe there are many misconceptions about advertising, as if it will bring in a significant amount of money. This is not a website with a large readership to make advertising as profitable as one would think. However, since so many of my readers suggested that I do advertise, I am willing to give it a try within this six-month trial period, especially if we fail to achieve our goal on June 5th. Are you interested in partnering with other websites, ministries, parishes, etc.? I am willing to listen to any proposals. Have you considered approaching the Ecumenical Patriarchate, the Greek or Antiochian Archdioceses, or your local Metropolis for additional funding and aid? Though I have considered it, it is not something I plan on doing any time soon. My primary goal is to establish myself and this ministry before I even begin to further consider something along those lines. Typically it is extremely difficult to receive financial support from such sources, if not impossible, as far as my experience with them go. Also, I don't believe an idealistic proposal of a vision will get me far. This would be more like a gamble than an investment. A presentation of a visible and tangible ministry is more realistic in garnering support at that level, and right now I am nowhere near that level. With help from my readers, this can be achieved. Why don't you become a non-profit? In time, this is something I plan on, however right now I don't think I meet the qualifications. Plus, even if I did qualify, it is an expensive and long process I would not be able to fulfill at the moment. Are you against ministries by converts or Russians? Not at all. In fact, I encourage them. Converts offer a perspective on things I could never have, and the websites with a more Slavic perspective are very important in the holistic presentation of universal Orthodoxy, which is what I am all about. The only thing I was trying to say in my last post was the extreme lack five years ago, and still today, of translated Greek material on the internet and the entire Romaic/Greek perspective. In fact, I would encourage many more ministries to show up, especially those who can offer unique perspectives from Romania, Serbia, Bulgaria, etc. We still have a long way to go. Thou shalt not profit off of this website. Trust God. A statement like this does not deserve to be respected with an answer, but I offer it here to show how silly some people can be. If people in full-time ministry never got paid for their time and work, and initiate some sort of fundraising when there is no other means of making the money to support the work, then no one would ever be in ministry, but they would need to be ministered to, because they would be homeless. Even monastics in monasteries and ascetics in the desert profit off their work in order to sustain themselves and aid in their own ministries if they have any. Anyone that ever makes statements like these I consider to be enemies of the mission of the Church, even if they appear to be "pious members". To conclude, this fundraising campaign is to bring awareness that ministries should and must be supported by all who benefit from them, and/or are moved by the fact that they benefit others. Protestants are aware of this, Catholics are aware of this, Muslims are aware of this, the Jews are aware of this, those in fringe groups and cults are aware of this. For these reasons Orthodox Christians should be the most aware of this. Below I once again offer my readers the opportunity to contribute. I will return on June 5th with a final update on the future of Mystagogy. As for Paypal, you do not have to be a member to donate if you wish to do so online with a credit or debit card. All you have to do is click on the DONATE button below, and on the bottom left corner you will see where it says "Don't have a PayPal account? ", click on "Continue" and follow the instructions. It's very simple. For those who do have a Paypal account or are willing to open one, you can make a donation of any amount by clicking on DONATE. If you would like to contribute a monthly amount that will be automatically deducted once a month, you can click on SUBSCRIBE and choose the amount you can afford. Thank you in advance very much for your support, and God bless you all abundantly.